Love, loss and obsession: Aria Entertainment’s double bill explores these themes with dramatically different outcomes. New British musical The Verb, To Love follows college lecturer Simon’s attempts to find a lasting relationship after breaking up with his boyfriend of 23 years. Mid-90’s Irish play Portia Coughlan shows the title role’s failure to function in day-to-day life whilst clinging to memories of her twin brother who drowned 15 years previously. Both productions, which can be seen singly or one after the other, depict emotion in its most raw, desperate state with committed performances and unique design elements. The Verb, To L ove by Andy Collyer is a two-hander but focuses almost exclusively on Simon (Martin Neely). 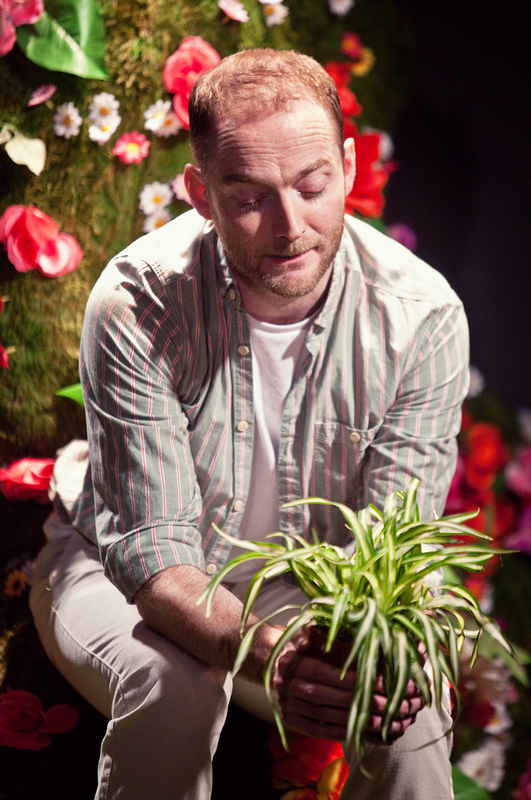 He falls in love with fellow teacher, the wide-eyed, much younger Ben (Gareth Bretherton) after a breakup. Simon sings us the story of their friendship progressing to a reluctant confession of love, but there is no happily ever after. Several years later after building a successful career, Ben decides its time to move on even though doting Simon would do anything for his “baby boy”. Simon’s songs then journey through the stages of grief and forays in online dating until he finds peace with his houseplants. Though billed as a musical there is little spoken dialogue. The contemporary musical theatre songs continuously flow into each other with few breaks and Ben doesn’t enter until he breaks up with Simon halfway through the show. Until their breakup, we hear their story exclusively from Simon’s perspective. Ben doesn’t interject often after he arrives, making this almost a one-man show. Even though it was only an hour, it’s a long time for Neely to sing almost continuously, which he does splendidly. This is clearly a musical under development, but it has plenty of potential. Simon’s character is detailed and well developed; Neely adds plenty of nuance. The songs have enough variation to not sound too similar, but with a strong motif. It would not take much to make this a full-length show: more scenes, more Ben, and possibly some other characters – though The Last 5 Years proves a two-hander works beautifully, particularly when telling the rise and fall of a relationship. More substance will also help dilute the sentimentality, though it was never cloying. Focusing the bulk of the story on Ben and Simon’s relationship gave the show a sturdy narrative arc rather than showing a snapshot from Simon’s life. There was no dancing, lighting changes corresponded with emotional intensity and the flowery parkland set reminded the audience that there is light at the end of every tough time. I look forward to seeing The Verb, To Love develop and hope Aria Entertainment stages it again in a more fully formed state. Marina Carr’s Portia Coughlan is m uch darker and more complete fare. Set in rural Ireland, Portia celebrates her thirtieth birthday. Fifteen years ago tomorrow, her twin brother drowned in the Belmont River that runs behind her father’s farm. She never recovered from his death, despite having a life that reads perfectly on paper: a wealthy husband, close family and three sons. Susan Stanley plays tortured Portia with a coiled spring intensity that never relents, even when drinking and flirting in the local pub. The verdant, grassy floor from The Verb, to Love remains, but a pool of water is Belmont River and a rustic kitchen set is her country home. The lighting is darker and ethereal music draws attention to the appearances of Portia’s ghostly brother, Gabriel. Similarly broken people with hidden family secrets inhabit Portia’s world. Her parents pop in uninvited and berate her for not fulfilling her wifely duties. Her paternal grandmother abuses her and her mother relentlessly. Her best friend Stacia helps Portia with the kids, but only has one eye and needs of her own. Her patient husband Raphael (Ben Mulhern) does his best to look after their children when Portia says she wants nothing to do with them, as she’s afraid she’ll harm them. She never wanted to be a mother. She never wanted to marry Raphael. She doesn’t really want anything to do with this world at all, instead dwells on her brother’s death. She tries to distract herself with love affairs, to no avail. The day after her birthday has a predicable outcome halfway through the play, but then the action jumps back in time for more horrific familial revelations. 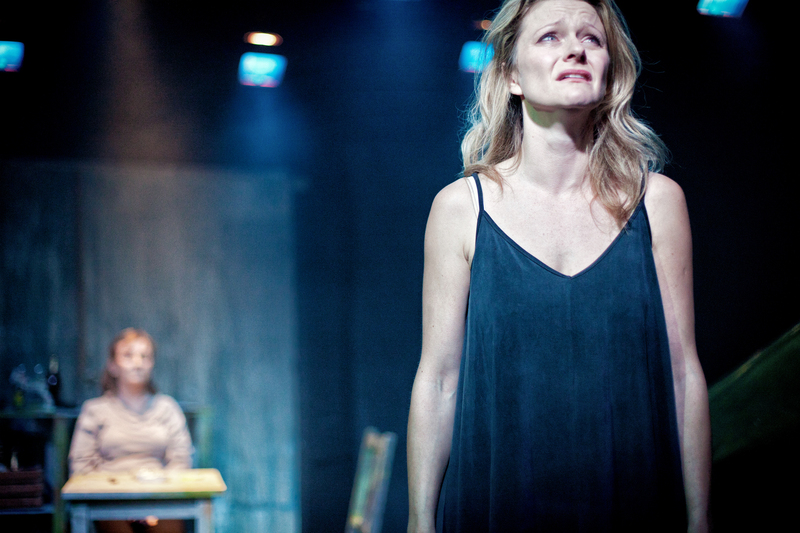 A cast of eleven creates Portia’s intimate, oppressive world of family, lovers and friends. Most have good intention in their hearts, but none of their efforts can save Portia from her deteriorating mental stability and Grabriel’s increasingly frequent, haunting presence. The dialogue is frank, but taps into an innate Irish poetry and spirit world of Celtic mythology. Though these characters simultaneously evoke pity and disdain, there is a grounded earthiness about them and their connections to each other. The ensemble work is excellent, particularly from those playing Portia’s family, though the other roles are certainly to be commended. Veronica Quilligan and James Holmes as older family friends, the Doorley’s, provide some comic relief and comfort amongst the abuse. Portia’s lovers Damus Halion (Alan Devally) and Fintan Goolan (Conan Sweeny) both barely conceal pent up rage and disdain for Portia. Even though she does not help herself, Portia is framed as a tragic hero, the victim of circumstances beyond her control. Carr’s writing is outstanding captures the often stark isolation of village life. Director Bronagh Lagan successfully captures the tone and mood of the play as it barrels towards its inevitable end. This is a production that would benefit from a larger venue and more space to create an even more atmospherically complex set. Though radically different in tone, these two productions show desperate characters on the brink of collapse. Simon has a much more supportive, comfortable life and manages to pull himself back from edge after some facebook stalking and late night phone calls to Ben. Portia’s brother eventually catches up with her, but no one in her village is functional enough to save her. We could all to easily find ourselves in similar circumstances, but I hope we tend more towards Simon than Portia. The pairing of these two pieces shows great insight and intuition in producer Katy Lipson of Aria Entertainment. An accomplished young producer who focuses on British musicals, she made a wise choice to pair The Verb, To Love with Portia Coughlan.